Children love playing outside from an early age, and there isn't a child alive who isn't enthralled by muddy puddles, mud pies and worms. Take advantage of this innate fascination for nature by fostering a love of gardening in your children. There's no better time than the summer! From age two, kids can help with simple gardening tasks such as digging, patting down soil, laying down seeds and sprinkling plants with water. Invest in a sprinkler attachment for your hosepipe and let your children get used to having fun in the dirt and watering plants. If their first experiences of gardening are relaxed and positive, you're onto a winning streak. Helping your child to be involved as much as possible is the key to success. Let them have a say in what plants and vegetables you want to grow – no doubt cauliflower won't be on the list! Give them simple tasks to perform, even if they're largely unnecessary, and let them know how much you appreciate their input and help. Another tip is to use a plot of land you know they will walk by often, maybe something visible from your front window or near their favourite play area. The more they see the development of the garden, the more interested they'll become. Children of this age can do a lot. Let them have a garden plot marked as theirs, and let them decide what they want to grow – within reason! If a task seems too complicated or dangerous, let them do the easy bit – dropping a bulb into a hole, for example, or pulling out worms. To ensure their interest doesn't lag until the plants show their heads, encourage them to keep a plant journal. Younger children can just draw pictures of what they hope the plants will look like, older ones can write notes concerning plant growth as well. Don't be afraid to let them make mistakes, it's all part of the learning process. 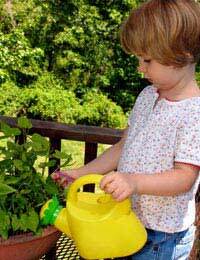 By this age, kids have often decided whether they like to garden or not. That doesn't mean it's too late to change their mind if they shy away from it, but it may be a bit harder. Teach them about things outside their immediate activity, such as the importance of composting, mulching and caring for the environment. Let them plan a meal around the vegetables grown in the garden, and have them invite friends over to share the bounty. In short, let them know what a wonderful thing a garden can be, and how much it can do for us. Children of this age are old enough to realise that gardening is not all about pulling up luscious veggies, it's also about weeding, raking and other tasks that can seem boring and dull. While you want to encourage your child to do the good as well as the bad and the ugly, don't overload them with unpleasant tasks, even if they are crying out to be done. You don't want your insistence on their complete involvement to backfire on you. If you have no garden or want to start small, nothing beats a windowsill as the perfect place to learn how to garden. Start by getting cheap containers from your local garden centre that are at least six inches deep. Then buy a potting mix and add some of your favourite herb plants or seeds – mint, lavender and thyme all work well. Water sparingly and use fertiliser about once monthly. Once you see some growth on your plants you can use the herbs, or if you have seeds wait until they are big enough to cut. Your kids will love eating something they've grown themselves! Instilling and nurturing a love of gardening in your children can develop into a lifelong love affair. Gardening is not only fun and educational, it's also good for health and good for the environment. If you are patient and show your children how it's done, no doubt they'll take your lead and end up loving to garden as well!